A personal reflection on a child's autism meltdown. Autism meltdowns are commonplace in our house. 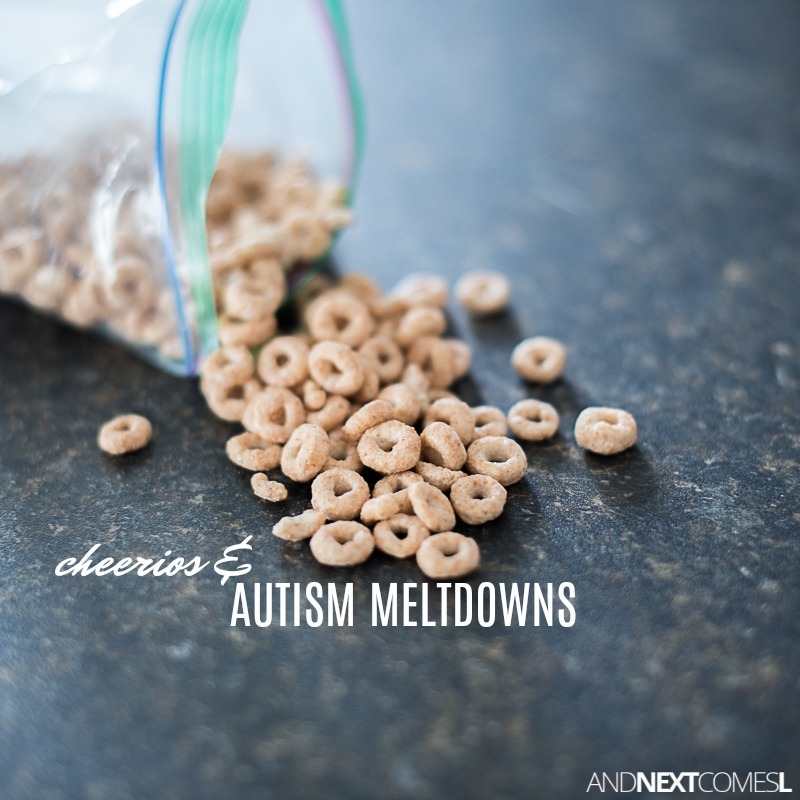 If you are a parent of an autistic child like myself, then you have likely been through your fair share of meltdowns with your child as well. For some reason, I felt compelled to write about a certain meltdown that occurred recently. I took to Instagram to share the story, but quickly hit the word limit. I didn't even know Instagram had a word limit. Now I do know. Anyway, I stripped the story down until the basic gist of the story still remained intact. You can see the original short form on Instagram here. Below you will find the original full version that I had hoped to share. It is never just about the cheerios. See, yesterday started off like any other Sunday morning. The kids sort of slept in. You know, until like 7 or 7:30, I am not really sure. As usual, they helped themselves to some cereal and, with bowls in their hands, slipped into J's room to play. I could hear their giggles from across the hall while I laid in bed, catching up on my blog emails and notifications. Just a regular lazy Sunday morning. Fast forward about 40 minutes, where the four of us piled into the car, the kids still in their pajamas, so we could go do a Pokemon Go raid. Because that is what we do. We game together every single day and explore new areas of the city together, in search of those digital pocket monsters. We have a lot of fun playing Pokemon Go together, even when it is freezing cold out, like it has been here in Saskatchewan. The kids each had a bag filled with sliced apples. And another bag filled with cheerios. But then I had to stop for a red light halfway to our destination, perhaps hitting the brakes a touch harder than usual. That is when one certain bag of cheerios, slightly open, slid off the back seat and onto the floor of our car. Little tiny Os now littered the floor. Apple cinnamon cheerios were everywhere. Then, as if a light switch was suddenly turned on, screams from the back seat. At that particular moment, the world around J was simply too much. And the only solution he could muster up was to turn around, head back home, and refill that bag with the exact same number of cheerios. We reassured him that there were still plenty of cheerios in the bag. Nope. He was not happy with that. He needed to have the bag refilled to the exact same number of cheerios until the moment they spilled upon the floor. There was only one possible way to fix this problem, according to him, and he would most definitely not budge. Typical for him during meltdowns. And we were not going to turn back around just to refill the bag of cheerios, even if that seemed like the easiest way out. Instead, my husband and I guided him through the meltdown as best as we could, letting the meltdown run its course. This meltdown was hard. Not for me, goodness no. But for him. It is always hard for him. He was helpless and distraught at this particular moment. He was angry and frustrated. Visibly upset. Just like the bag of cheerios. But it was never about those damn cheerios in the first place. His meltdowns are always a build up of something else. What was it in this case? That, I have no idea. When we got home some 20 or so minutes later, he still went on, in between yelling and crying and hitting, about the apple cinnamon cheerios and how he needed more in that bag. But as with all meltdowns, they eventually subside. And as always, I am there for J during and after those meltdowns. Because I am his safe place. After the meltdown, it was like the cheerios never even existed. They were no longer important to him. 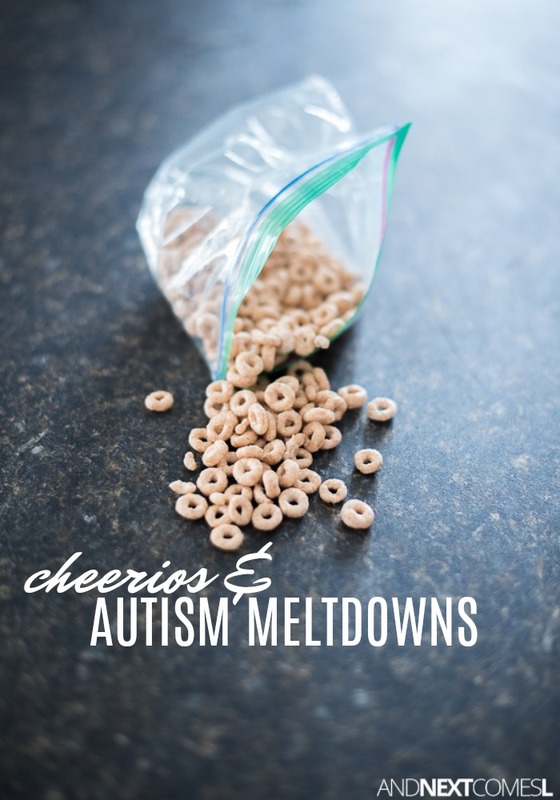 Because meltdowns are rarely ever actually about the little things like cheerios. They are always the expression of something else, something bigger. Yesterday, cheerios were the breaking point for him. Today it could be something entirely different. But all that matters is that he knows I will be there to help him pick up the cheerios.